The transportation sector is a major polluter and it is the economic sector with the biggest net effect on climate change. While some other sectors (such as industry and power generation) emit more greenhouse gases, these industries also emit other substances that lead to cooling (aerosols of sulfate, nitrate and others). Of course, self-driving cars will not reduce the number of trips or kilometers traveled. On the contrary: self-driving cars have the potential to significantly lower the total cost per kilometer traveled and are thus likely to induce people to make more trips. As we have shown in other papers, self-driving taxis and buses will emerge rapidly and offer mobility services for local and long distance traffic with great convenience and at extremely competitive prices because they can achieve much higher utilization rates than private cars (which stand idle more than 94% of the time), and because autonomous fleet vehicles will be engineered for the minimization of total cost of ownership and for the maximization of useful life. Most urban self-driving taxis will be fully electric for reasons that are not primarily environmental but that are still good for the environment: Electric motors offer safety advantages (they can be used for emergency braking and to some degree for emergency steering). They are also much more durable (an electric motor easily lasts 1 million kilometers), less expensive and less complex than conventional engines. In addition self-driving taxis that operate in local traffic will not need huge battery packs when average trip sizes rarely exceed 15 kilometers and when they can drive themselves to the next high efficiency charging station as needed. Their batteries won’t be sized to last a whole day; they will need to be just large enough to service a little more than the trips of the morning peak – after which they can recharge. Self-driving taxis reduce demand for private cars and therefore reduce the sizable greenhouse gas emissions during vehicle manufacturing which are typically more than 10% of total life-cycle emissions of a car. According to some estimates, a self-driving car-sharing vehicle or taxi can eliminate 7 to 10 private cars. What a potential for greenhouse gas reduction in auto manufacturing! Self-driving taxis facilitate ride sharing especially during peak hours and on certain routes. On the other hand, the effect of self-driving taxis on public transport is not yet clear. There is both the risk that some local trips which are taken by public bus today will migrate to self-driving taxis and the opportunity to capture a much larger share of the mobility demands with self-driving scheduled and on-demand buses and mini-buses – potentially in multi modal combinations. The potential benefits are large and there will certainly be a place for efficient self-driving mobility services using self-driving buses and mini-buses. Concerns that new mobility solutions centered around self-driving taxis and mini-buses will be less environmentally efficient than current scheduled buses are not warranted because today’s scheduled buses are not very good for the environment during off-peak hours when they travel near-empty. The currently most overlooked aspect of self-driving vehicles is their effect on medium and long-distance travel in areas with sufficient population densities. Whereas today many people choose their own vehicle for distances between 100km and 500km self-driving taxis and self-driving buses make it much easier to provide excellent, extremely cost efficient long distance mobility services. When urban taxis at both origin and destination guarantee painless individual personal mobility and when small or medium-size autonomous buses provide long distance travel at extremely low rates which are much lower than the cost of traveling in a private car, then greenhouse gas emissions can be reduced very significantly. Although only a small percentage of all trips are more than 100km in length, these trips represent a large share of the total distance traveled in private cars and therefore have a large and easily overlooked potential for reducing greenhouse gas emissions. The big advantage of self-driving car technology is that it can accomplish several benefits at the same time: It increases the options for individual mobility and lowers the cost of individual mobility because of new driverless mobility services which through increased sharing, more efficient use and quicker adoption of alternative fuels reduces greenhouse gas emissions. Nobody will have to abandon their cherished car but the joint actions of the large group of less or only moderately affluent consumers who value the flexibility and cost-saving associated with self-driving mobility services will inexorably lead to a reduction of greenhouse car emissions. It is time for the political leaders searching for solutions to combat climate change to take notice! 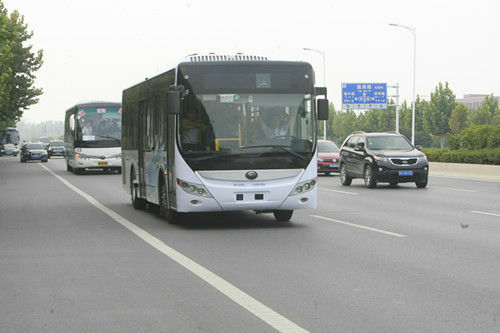 After three years of development, one of the leading Chinese bus manufacturers Yutong has sent the prototype of a self-driving city bus on a 32 km long circuit on an intercity road between Zhengzhou and Kaifeng in Henan Province. The bus drove the whole track in regular traffic without any human assistance, attained a peak speed of 68 km/h, passed 26 traffic lights and was able to change lanes and overtake autonomously. This is a significant accomplishment and clearly puts Yutong on the map for autonomous driving. The bus is equipped with many sensors, including camera and Lidar. Two Lidar sensors are strategically placed in the middle of both sides of the car. This is the best way to monitor the adjacent lanes and mimics the approach Google has taken on their driverless pods (where the side Lidars protrude like the mirrors of conventional cars). The company’s press release points out that significant additional development is required. No further information about the timeline for the introduction of such a bus was provided. Self-driving buses are very promising and will be a key ingredient of future mobility. On demand-buses will be able to service the complex mobility demands of our societies much better than today’s mix of scheduled buses, trains, and individual cars. They will lower the cost, resource consumption and ecological footprint of mobility. Because significantly lower costs will prompt many travelers to use buses on medium to long-distance trips instead of cars, these buses will increase the effective capacity of highways when measured in people-miles. Update 2016-02-21: The bus traveled between Zhengzhou and Kaifeng in Henan Province. The approximate route can be looked up on Google maps. Policy makers need to familiarize themselves with the potential benefits of self-driving cars. First, they need to get the concepts right and clearly distinguish self-driving cars (which can drive without human supervision, even empty, and don’t need additional infrastructure) from other technologies such as driver assistance systems and connected cars. Connected cars and driver assistance systems are certainly also interesting topics but their benefits pale in comparison to the benefits of cars that drive themselves. Besides greatly reducing accidents, self-driving cars also bring individual motorized mobility to those who do not have a driver’s license – including people with disabilities and the elderly. They reduce energy consumption, simplify the introduction of alternative fuels and reduce the load on the road infrastructure. Policy makers need to recognize that self-driving cars can solve or greatly reduce many longstanding problems. This is not a technology where a wait-and-see attitude is warranted. Politicians need to actively promote this technology. Of course, this does not mean that the technology’s risk should be ignored. Safety is a key concern and a key benefit of self-driving cars. There is good reason to expect mature self-driving cars to drive much safer than humans. They are equipped with 360 degree sensors, including cameras, radar and Lidar, are always alert, never tired, don’t drink and adopt a defensive, risk-minimizing driving strategy. But letting the first such cars drive by themselves on public streets is a difficult decision: what if anything goes wrong? The application of the precautionary principle avoids this situation by requiring the developer to prove that the car is harmless. Unfortunately, proving that a self-driving car is safe is a hard problem and strict application of the principle could significantly delay the introduction of self-driving vehicles. This weakness of the precautionary principle is well-known: There is the risk that erring on the side of caution when certifying self-driving cars prolongs the current carnage on our on our roads. Unfortunately, we don’t have the luxury to delay a well-functioning self-driving car for a few more years to be extra-sure that everything is perfect when 33,000 people die in traffic accidents per year in the US alone and more than 1 million per year worldwide. As much as it is not acceptable to let first prototypes roam the streets unsupervised it is not acceptable to delay and delay just to be on the safe side. A middle ground must be found. This is not an easy task for policy makers but one on which lives depend. Will autonomous vehicle technology gradually evolve from driver assistance systems? Will they first appear on the highway or in low-speed local settings? What new business models will emerge and what role will machines play? Will the US be the first to legalize fully autonomous vehicles or does the Vienna Convention on road traffic really prevent many European Countries from adopting self-driving vehicles? There are so many paths that this technology can take, so many changes in many different areas of business and society, so many proponents and possibly opponents that it is hard to be right about the path of technology and – consequently – of law. It is very dangerous to assume that the technology will evolve in one way, then regulate for this situation and subsequently find that the technology evolves very differently. This section was originally entitled ‘minimize legislative and regulatory intervention’ and included the goal to give the innovators the space to innovate. But here I differ with Scribner: Unfortunately, transportation law is so much based on the concept of vehicles driven by humans that many laws do need to be changed. Current traffic laws contain so many elements that inhibit progress for this new and safer technology. Autonomous vehicles change the concept of what a car is and the laws need to be updated accordingly. Otherwise innovators will find it hard to make progress. This is a task that should be started immediately – before fully autonomous vehicles are ready for public roads. Laws and regulations should be technologically neutral. As much possible, they should avoid favoring a specific technical approach. Sometimes the breakthrough for a new technology does not materialize in one of those fields which receive most attention and where everybody expects the solution. When the British needed a practical method for determining a ship’s longitude in the 18th century, they spent many decades gazing at the stars, compiling lunar tables and searching for astronomic methods for determining longitude. But the breakthrough came with an entirely different technology: an extremely precise clock! Longitude could now be determined quickly and easily by comparing the clock’s Greenwich time with local time (which can be calculated by tracking the rise of sun). Today, electric mobility is in a similar situation: Billions of dollars have been invested in improving the usual components for electric vehicles: Battery technology – already quite advanced – is being perfected; charging infrastructures are being deployed; production processes are optimized and many of the legal and financial obstacles have been removed. Nevertheless, a real breakthrough is not in sight. As armies of engineers work on these problems, a much smaller group works on another technology which at first glance is not related to e-mobility: They develop autonomous vehicles that can drive themselves on regular roads and don’t require human input or modifications to the road infrastructure. Only a deeper analysis shows how important fully autonomous vehicles will be for e-mobility: This technology changes fundamental aspects of mobility and enables alternative mobility scenarios which are more compatible with electric vehicles and where the biggest disadvantage of electric vehicles – their limited range – are much less of a concern. Range matters only in the current configuration of individual mobility which is based on individually-owned cars. If mobility is provided by fleets of driverless cars, then range limitations are no longer a problem because urban trips have an average trip length of less than 10km. They are much shorter than the range limits of current electric vehicles. 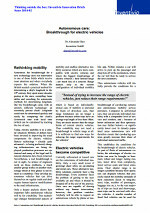 Thus e-mobility may not need a breakthrough in vehicle range at all. It is sufficient to find new ways for reducing the range requirements for the vehicles! Currently self-owned or leased cars are the cornerstone of individual mobility. Only a very small (even if growing) share relies on car-sharing and rental cars. These alternative mobility solutions currently have a big disadvantage: Every customer faces the problem of getting to the next available car and where it should be dropped off at the end of the journey. Once cars are capable of driving without any human intervention, however, this problem vanishes. Anybody will be able to request an autonomous vehicle by phone or mobile app. Within minutes a car will arrive to pick up the passenger and drop him off at the destination, where the car will then be ready to service the next customers. Thus autonomous vehicles will initially provide the conditions for a breakthrough of car-sharing systems and autonomous mobility service providers. Compared to self-owned cars, they can provide individual mobility with a comparable level of service and comfort, and – because of better utilization and fleet optimization (see further below) – at significantly lower cost. In densely populated areas autonomous cars will therefore ensure that car-sharing systems greatly increase their share of individual motorized traffic. This establishes the conditions for the breakthrough of electric vehicles. As part of fleets of autonomous vehicles, the advantages of electric vehicles can now be brought to bear: more robust and longer lasting motors, lower drive train complexity, lower service costs and lower emissions. Their shorter range is no longer a problem because fleet operators can dispatch vehicles that precisely match the mobility demands of their customers (local vs long-distance trips, number of passengers, baggage size etc.). As the vast majority of trips are local and short-range, most trips can be serviced with electric vehicles. A smaller number of fossil fuel vehicles can be used for long-distance trips. Thus fleets are likely to consist mostly of small electric two-seaters; only a smaller part will consist of larger vehicles or rely on fossil fuels. This potential for demand-based fleet optimization is a novelty that is only possible when cars can drive themselves to the customer. In this way total costs and resource consumption related to mobility can be reduced significantly. 1) The first fleets with fully autonomous vehicles will appear in niche areas where it is easiest to control risk. Their speed and range will initially be quite low. At first, they may even travel partially on their own lanes and only later will increase their capabilities. An example is the project in Milton Keynes where 100 autonomous electric vehicles will be installed between 2015 and 2017 to ferry people between train station and city center. The requirements for these vehicles with respect to range, maximum speed, number of seats etc. differ markedly from the requirements for traditional cars. Current car models therefore do not constitute a good match for the first autonomous car fleets – even if they had been adapted for fully autonomous operation. At the same time, car manufactures are probably not eager to develop specialized low-volume models for use in early autonomous car fleets. 2) Current car models of the auto industry are not suitable for fully autonomous operation – even those with advanced driver assistance systems. They must be modified for pure fly-by-wire operation. All safety-critical components and systems have to be redundant. The modifications used in current prototypes and test vehicles are not suitable for productive use. It it is not at all trivial to adapt current car models for fully autonomous operation. Therefore the auto industry needs to develop a new vehicle platform from the ground up for fully autonomous operation. This could be a complex and time-consuming effort which will take longer than many fleet operators will be prepared to wait for. 3) The design and production of a small number of fully autonomous electric vehicles for local transport as part of fully autonomous fleets is much faster and easier than the design and production of classical cars adapted to the needs of fully autonomous mobility service providers. The complexity of electric vehicles is lower; relying on electric propulsion simplifies the redundant layout of all safety critical components. As an example, an electric motor has inherent safety benefits: It can be used for braking; if the motors are integrated into the wheels they could even play a role in emergency steering. Whereas currently the lack of a national charging infrastructure for electric vehicles is often cited as a major problem, this problem also goes away when fleets of driverless urban cars are used. Because these vehicles are only used in local traffic in a specific region, it is sufficient to deploy the charging infrastructure for exactly that region and the actual number of electric vehicles and actual mobility demand. The infrastructure can then grow in synch with the fleet; it is no longer necessary to build up large infrastructures long before the first electric vehicles are placed into operation. Some innovations trigger intensive economic and societal changes which can advance with astonishing speed if they significantly change the cost structure and efficiency of processes. The power loom and the railroads are only two examples that highlight the potential dynamics. Market forces work especially well, when they are brought to bear on inefficiently used capital-intensive resources. Such inefficiencies are very pronounced in transportation: Cars are among the largest single investments of private households; but their average utilization rarely exceed 6% – an incredible waste of capital. Therefore the potential for savings is enormous. The average US households spends more than 16% of its total expenses on car-based transportation. A study of the Earth Sciences Institute at Columbia University has analyzed the savings potentials associated with fleets of self-driving cars in detail. They performed a simulation study based on the mobility patterns of Ann Arbor, a medium size city in Michigan which had about 285,000 inhabitants and 200,000 cars in 2009. 120,000 of these cars were used primarily for local traffic. Each day, 528,000 local trips occur in Ann Arbor with an average trip length of 9.3km and about 1.4 passengers per vehicle. The authors found that a fleet of 18,000 autonomous vehicles would be sufficient to satisfy the local mobility demand in Ann Arbor and ensure that no passenger would have to wait more than 60 seconds for their car – even during rush hours. This translates into a reduction in the number of cars by almost a factor of 7! Whereas a privately owned car with a range of 16,000km per year leads to costs of 0.46$/km, the fleet of driverless cars would reduce the costs per passenger-km to 0.25$. The study also examined the use of light electric vehicles instead of mid-size sedans which are typical used for car rentals. With electric vehicles, the costs would fall even further to 0,09$ per passenger-km. This is a cost reduction by a factor of five! Although the study has not included all potential savings (not included were savings related to parking, congestion, aggregation of mobility demand, freed-up time) it clearly shows that this innovation has very high savings potential and can lead to a large increase in spending power for the individual. Even if not all consumers act rationally at all times, these calculations imply that a large number of households will choose autonomous mobility services instead of buying their own car in the future (we subsume the special case where a household purchases their own autonomous car but then rents it out to others as another variation of the fleet model). Only a smaller number of households will value the prestige of their own car or their love towards a car high enough to continue owning a car. Another factor which will accelerate the growth of fully autonomous mobility providers is that even households which own a car will become customers of autonomous mobility services because they need their services in some situations: when a member of the family needs to be picked up somewhere, when multiple members of the household need to drive to different locations but the household does not have as many cars, when flying to other cities, etc. More and more people will then find that they can get around quite well without their own car. The number of situations in life where owning a car is almost a necessity will dwindle. Today there are many people for whom their own car is the only realistic way for getting to work. Fleets of driverless cars will greatly reduce such cases and therefore reduced the perceived need to purchase a car. The transformation of mobility caused by fully autonomous cars will require some time. Despite the large advances of the last 30 years and the impressive prototypes which have been demonstrated by car manufactures (Daimler, Audi, Nissan), research institutes, Google and others, significant hurdles remain until fully autonomous cars will be able to drive on all roads without human intervention. Currently there are two different visions of the path towards full autonomy. The conventional vision assumes that autonomous technology will gradually evolve towards more and more advanced driver assistance systems until finally reaching full autonomy. It uses the typical diffusion process of automotive innovations (such as airbag and anti-lock braking) as a reference and assumes that the technology will slowly trickle down from the premium models to the middle-class models until it becomes standard for all new cars. However, there are significant hurdles – including regulatory problems – on this path. Several generations of models with ever more advanced driver assistance systems, with complete fly-by-wire and redundant layout of all safety-critical systems will be needed until models with full autonomy will appear on the market. If we follow this line of reasoning, then it may be well after 2030 that such cars are available in larger numbers and a decade or two more until fully autonomous technology is available in most cars. In addition, electric vehicles do not feature on this path, because it is based on personally-owned vehicles where range limitations of electric vehicles will continue to be a major problem. However, there is a second path toward full autonomy which does not adhere to the standard car industry model of technology diffusion. Instead of trying to gradually integrate the technology into consumer cars, this path seeks to capitalize on the inherent advantages of full autonomy and targets those niches where full autonomy has the largest impact and can be implemented with a minimum of risk. We have seen above that full autonomy can greatly reduce mobility costs by providing mobility as a service using fleets of self-driving cars. A natural path towards full autonomy therefore starts with small, short range and most likely electric vehicles that provide local mobility at low speeds and in increasingly less controlled environments. The challenge for the pioneers is to find those settings which are best suited for limited, low speed operations of autonomous vehicles and which provide the best environment for their growth. There is no shortage in candidates. Several systems with very low autonomy are already in operation: The ‘UltraPods’ at Heathrow Airport are electric autonomous four-seaters which ferry passengers between Terminal 5 and a parking lot. They run on separate lanes and use transponder chips embedded every few meters in the lanes for determining their position accurately. They also rely on internal lane maps for navigation. A similar approach has been adopted in the Netherlands where 6 autonomous electric buses carry people along a stretch of about 2km. A next step for such systems is to leave the confines of separate lanes at least in some cases and merge with regular traffic. Such an approach is planned for Milton Keynes, a British city, where 100 electric autonomous vehicles will be installed between 2015 and 2017 to transport people between the train station and the city center at low speed. Initially these vehicles will run on dedicated lanes (taken from current sidewalks); by 2017 they will expand their range and will be able to share lanes with pedestrians (there are currently no plans to put these cars onto the streets). This project has the advantage of minimizing risk while at the same time advancing the envelope of autonomous vehicles: algorithms will be perfected; approaches for the operational management of distributed fleets of self-driving vehicles will be developed; customer experience, preferences and service valuation will be understood better, a vehicular platform and technology architecture will be developed. There are many areas where autonomous electric vehicles with even this limited capability are useful and can become economically viable very quickly. Similar approaches can be implemented in many cities where electric cars or buses may be installed for specific routes. Initially some infrastructure measures (such as separate lanes, fences which keep pedestrians away from the street, external sensors at critical locations) may be adopted; as experience and intelligence of the vehicle increases, these infrastructure measures can become obsolete. Another variant of this approach would be if car makers or Google decided to implement their autonomous technology in a fleet of electric city vehicles that would operate on carefully selected routes in a suitable city. There are many ways in which this could unfold but there is no shortage of possible approaches for starting on a growth path for such fleets of autonomous electric vehicles. As the Milton Keynes Project shows, this is possible even with limited budgets. Another advantage of this second path is a legal issue: A fleet of self-driving cars can be regarded as an intelligent transport system where the vehicles run on exactly specified paths. For such systems the legal limitations of the Vienna Convention on traffic which requires that every vehicle must be controlled by a driver at all times do not apply. This eliminates key legal problems which probably exist in countries which have ratified the convention (not ratified by: US, UK, Spain, China, Singapore and others). Even if the question has not been finally clarified, it is clear that countries have a considerable margin of interpretation which allows the implementation of fleets of driverless vehicles already today. Overall, this alternative path to autonomous technology based on fleets of electric vehicles used for niche applications in controlled settings for urban local mobility is much more realistic and faster to implement than the vision of a universal fully autonomous car which can be used on all roads by anybody.